Only 7/8ths of a yard of small checked linen or ruggad unbleached linen, 6.5 oz is required. Checks are the best for hiding stains but unbleached was the cheapest available fabric for the poor. A fabric called duck may also be used and the closest available to duck is Russia sheeting which is a very sturdy fabric for hard playing boys! Notions needed are white or natural 1/4" cotton twill or 3/4 yard of 1/4" linen tape and 35/2 or 50/3 linen thread in a color to match the fabric. Two sizes are included in one pattern. Small fits up to c. 24" chest and large fits up to c. 28" chest. 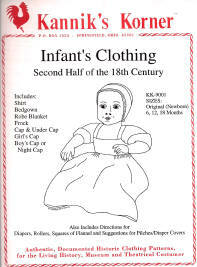 Along with a concise history of infants clothing, this complete pattern includes shirt, bedgown (two styles), robe blanket, frock, cap and under cap, girl's cap, and boy's or night cap. There are also directions for diapers, rollers, squares of flannel and suggestions for pilches/diaper covers. Please note that the sleeves run small in this pattern and making the largest sizes are best for today's large babies. To make the shirt, caps and under cap all require one yard of 2.8 oz. linen or 3.7 oz. linen, 1/8" white cotton twill tape and 90/2 or 120/2 linen thread. The robe blanket requires 1 1/8 yard of white wool flannel, 4 3/8 yards of 1/2 to 5/8" 3/4" silk ribbon and 60/2 linen thread. The bedgown requires 1 5/8 yard of printed cotton, and 1/8" and 1/2" white cotton twill tape. The child's frock requires 2 1/4 yard printed cotton, 1/4 yard of 2.8 oz. linen or 3.7 oz. linen and 1/8" white cotton twill tape. Since we sell 1/8" cotton twill tape in 10 yard balls one is enough to make all the garments. To make diapers 1/2 yard of diaper cloth will make 2 diapers 18 by 30". As a parent I have found making several diapers will be very useful first as burp rags and later to wipe faces or spills even if they are not used as actual diapers. To make the gown 2 1/4 yds of 45 inch wide light to medium weight linen are required. The petticoat requires an additional 1 yard plus a 1/4 yard (for the waistband) of light to medium weight linen, 6 pairs of small hooks and eyes, 2 yards (for option three you will need 4 yards) of 1/2 inch wide cotton twill or linen tape and 5 yards of optional lace trim. The shirt requires only 3/8 yard of 45" wide of fine white linen and 1/8" white cotton twill tape. For all garments 60/2 linen thread will be needed for hand sewing. 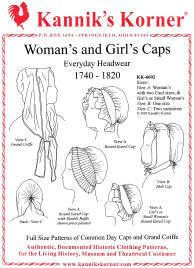 This pattern includes many styles of everyday headgear used from 1740-1820. Caps are a good place for a girl to start sewing since the seams are short. One half yard of 2.8 oz. linen or one yard of organdy is plenty for most caps. For poorer impressions 3.7 oz. linen will do. Most styles require 1/8" white cotton twill tape and 90/2 or 120/2 linen thread. 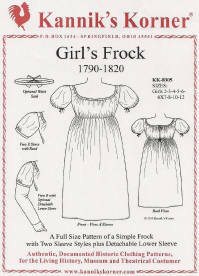 Girl's pattern includes everything necessary for the young lady from New France. 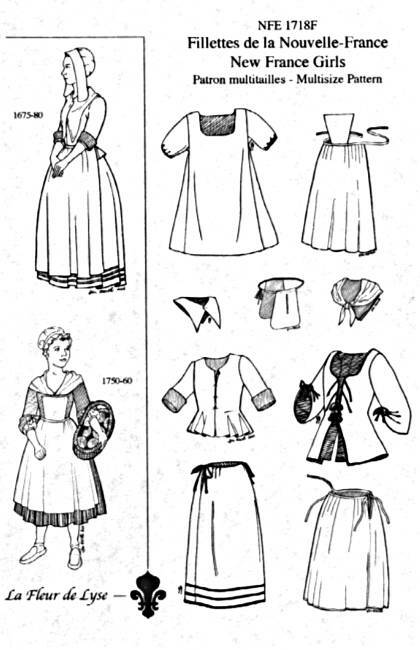 Shift and pockets; two styles of lined bodices; Instructions for hanckerchief, collar, petticoat and apron; long lappets cap (17th century) ruffled cap (18th century); cape. Suzanne Gousse writes, "We offer here basic clothing for girls living in the country or in town, being daughters of peasants or artisans as well as young servants and apprentices. . . . First choose the persona and follow the historical notes included here and the technical information on the pattern pieces to create a complete set of clothing for either century". This pattern is adapted for girls from the Woman's Caps & Bonnets pattern KK-6603. Three of the bonnet style views have been adapted, and are labeled to match the woman's views if mother and daughter would like to wear the same style. The pattern includes a total of 12 variations plus optional ties with three bonnet brim styles, made with pasteboard stiffened brims, and the caul (soft back part) can be gathered or pleated and attached over or under the front brim. In The Proceedings of the Old Bailey, London of 1809, in a theft trial the accused explained in her defense "it was a very windy day, I had my little girl in my arms; my little girl's bonnet bew [sic] off her head, a woman behind me came and picked it up, she said it was very cold". The bonnet requires about 5/8 yd. 58" wide silk taffita. Notions for the bonnet include 3/4 yd. of 1/4" or 3/8" wide grosgrain ribbon, and both heavy 16/2 linen thread and medium 35/2 linen thread. Also required is pasteboard, shellac and denatured alcohol, and 2/3 yard of millinery wire (optional) of 18 or 19 gauge. Based on original 18th century directions, this pattern is appropriate for 1775 to 1800 although similar cap and bonnets were used earlier. In The Proceedings of the Old Bailey, London of 1774, two women "were indicted for stealing . . . one black silk bonnet, value 4 s. one black sattin bonnet, value 2 s. one white silk bonnet, value 1 s."
A half yard of 2.8 oz. linen is enough for two caps. Notions for the cap include 1/8" white cotton twill tape and 90/2 white linen thread. The bonnet requires about 2/3 yd. worsted wool or black brown, green, blue, or drab. Notions for the bonnet include 3/4 yd. of 1/4" wide grosgrain ribbon, and both heavy 16/2 linen thread and medium 35/2 linen thread. After visiting many museums across the US and England, Larkin and Smith have been giving gown workshops for over 12 years. 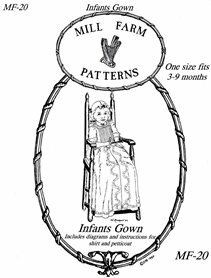 This gown pattern is developed from these years of examining extant gowns and practical fitting of gowns on modern bodies. 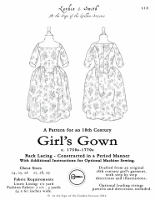 If you like this pattern try the Larkin and Smith Woman's English Gown Pattern. The gown requiures between 2 1/2 to 3 yards of 60" (more may be needed when using stripes or prints) medium to heavy weight linen, printed cotton, heavy silk or light weight wool. For lining the bodice 1/2 yd. medium weight linen is required. For hand sewing one spool of 35/2 linen thread is required. Sizes 24, 25, 26 and 27, 28, 29. This is perfect for the little ladies with its back lacing and allowance for grow tucks. The gown requiures between 1 1/2 to 3 yards 60" (more may be needed when using stripes or prints) medium to heavy weight linen, printed cotton, or light weight wool. 1/2 yd. linen buckram interfacing, 1/2 yd. medium weight linen for the bodice lining, 2 yds. 1/4" cotton twill tape, two strips of metal or feather boning for center back and 35/2 linen thread for hand sewing. The shift requiures between 1 1/2 to 2 1/2 yards 60" off white linen shirting, 5.5 oz., 2 1/2 yds. 1/4" cotton twill tape, and 35/2 linen thread for hand sewing. Sizes 2/3: 4/5: 6/7: 8/9: 10/11. Three year olds in the Mill Farm Girl's Gown made of striped linsey woolsey at left and mixed wool flannel at right. This is a full size pattern of a simple frock with two sleeve styles plus detachable lower sleeve and an optional waist sash. In The Proceedings of the Old Bailey, London of 1807, two women "I am a pawnbroker, I live in Wood-street, Cheapside. Three flat irons, a table cloth, and a childs frock, were pawned at different times at my shop"
To make this girl's frock you will need between 1 1/2 to 2 yards of very fine cotton similar to batiste, small scale printed cotton or light weight linen fabric. Notions required are 1/8" cotton twill tape for drawstrings and 1/4" cotton twill tape for drawstring casing and 35/2 or 50/3 linen thread or cotton thread to match the fabric. Young girls love this Little Red Riding Hood cloak in scarlet red which was a very common color in England and Virginia (possibly other areas). 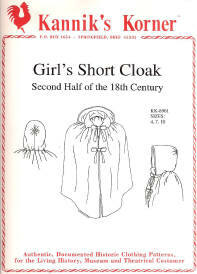 Short cloaks were the preferred cloaks for girls during the second half of the 18th century. Very convenient for hard playing girls, short cloaks stay closed whereas full length cloaks get in the way. This pattern may be easily lengthened requiring additional fabric and tape. This includes sizes 4, 7 & 10. To make this short cloak you will need between 1 3/8 to 1 5/8 yards of wool fabric. Notions required are 2 to 2 5/8 yards of 5/8" or 1/2" worsted tape, 1 7/8 yards of 7/8" worsted tape and 35/2 or 50/3 linen thread usually the thread and tapes match the color of the cloak. Size four shirts may be made of 1 5/8 yd. but size 14 requires 2 3/8 yd. of off white linen shirting, 5.5 oz.. For poorer impressions unbleached linen, 6.5 oz will do or for a warm winter shirt white wool flannel. Three buttons may be made of thread shirt buttons, or cloth covered buttons or tape ties to match the color of the shirt. For hand sewing the shirt use 35/2 linen thread to match. 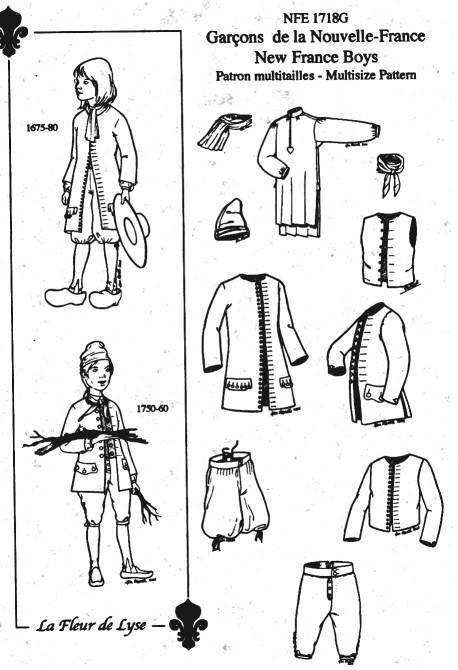 Everything you need to dress young boys for the 17th or 18th century in New France. Includes Shirt; Short vest and two styles of waistcoats; Two styles of breeches; Cap and instructions for cravat and handkerchief. 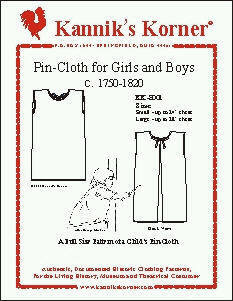 Suzanne Gousse writes, "We offer here basic clothing for boys living in the country or in town, being sons of peasants or artisans as well as young servants and apprentices. . . . First choose the persona and follow the historical notes included here and the technical information on the pattern pieces to create a complete set of clothing for either century". Required fabric is about 1 1/4 to 2 yards linen, or light weight wool fabric and about 1/2 yard of linen buckram interfacing. Notions required are 27 buttons or button molds of 1/2" or 3/4" size, and 35/2 or 50/3 linen thread. Just like his father's waistcoat, this pattern also includes a diagram and instructions for making a shirt. Chest sizes 23/24; 25/26; 27/28. Required fabric is about 1 yard for the smallest size and 2 yards for the larger of linen, or light weight wool fabric and about 1/2 yard of light linen for a lining. Notions required are one roll of 1/4" cotton tape, 15 buttons or button molds of 1/2" or 5/8", and 35/2 or 50/3 linen thread.